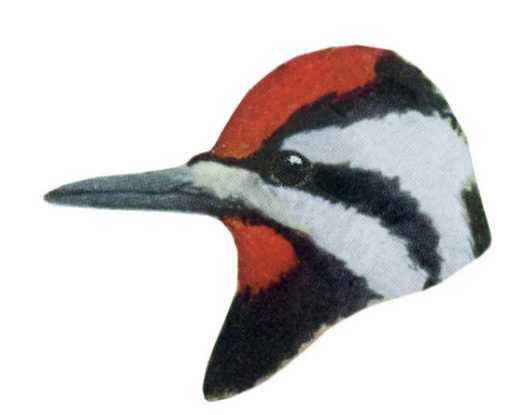 Build the yellow-bellied sapsucker birdhouse with red cedar, pine, or almost any soft wood. Use wood rough-cut on both sides so that birds can grip both interior and exterior surfaces. Make a 5″ by 5″ floor (inside dimensions) and a 12″ floor to ceiling height (inside front). Drill a 1 1/2″ diameter entrance hole located 10″ above the floor (to top of hole). Cut or drill ventilation openings in the floor and under the roof. Attach a hinged roof for easy access to monitor and clean. Use shutter hooks to secure roof in closed position. Or make a fixed roof and side opening doors. Always use corrosion resistant screws and hardware. Drill countersunk pilot holes in primary work pieces. Drill regular pilot holes in secondary work pieces. This reduces a tendency for wood to split. It also makes for easy assembly in minutes with a power or hand held screwdriver. Extend the back wall panel beyond both top and bottom. Drill pilot holes in these long panels for mounting. Drill an extra mounting hole inside the box just under the roof. Stagger these holes so that all are not in line along a single wood grain. Holes in line with grain can weaken and cause wood to split. For Yellow-bellied Sapsuckers, place in woodland edges near clearings within the proximity of lowlands and water. Mount from just out of reach to twenty feet – no more than can safely be reached and returned to for yearly maintenance. Installations out of reach and much further should be installed and maintained by professionals: carpenters, electricians, line workers, etc. with the right equipment and experience. The Sapsucker often excavates new cavities (often in the same tree). Fill the box with wood chips, or half full. It’s debated. 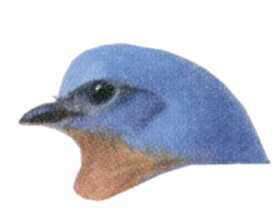 For Eastern Bluebirds mount bluebird houses 3′ to 6′ high in partial sun and shade on posts in woodland clearings, grove and shelter belt edges bordering fields, among scattered trees, or pasture fence lines. On fence lines mount boxes on the sides of posts facing the next post. The recessed position helps avoid cattle or other large animals that like to rub against them. Make a “bluebird trail” of several houses about 100 yards apart; further in wide open expanses and closer in clearings of wooded areas. Monitor the boxes for unwanted squatters. Deter predators with steel posts or sheet metal wrapped around wood posts. Avoid shade, but also avoid prolonged direct sunlight through the entrance if possible. Tree swallow nest boxes placed between bluebird nest boxes invite good neighbors that will help defend against sparrows, but these bird houses also invite sparrows, so monitor the swallow houses as well as the bluebird houses. Chickadees, Nuthatches, Titmice, Wrens, Tree and Violet Green Swallows (and sparrows!) 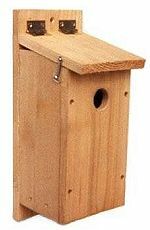 may use this nest box.